This 2-bedroom, 1-bath cabin is perfect for couples, a small family, or a romantic getaway! The air-conditioned home can accommodate 6 guests, with its queen bed and two sleeper sofas. The living room has a large stone fireplace, as well as satellite TV. Perhaps the home’s best feature is “outside” — a large rooftop patio for sunbathing and relaxing, with a view of the lake, and a large gas grill for cooking outdoors under the trees. Guests can use a boat tie-up at the nearby Island Dock. Amenities include: Internet and WiFi; Satellite TV with Home Theater System, VCR and DVD player; Fireplace, Microwave, Dishwasher, Washer/Dryer, Central Heat & air conditioning; Ping Pong table. Bass Lake offers boating, hiking, fishing, and bicycling. 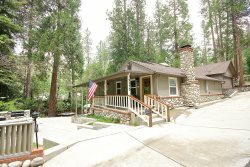 The Willow Cove-area cabin is within walking distance of the Pines Village area at Bass Lake, which provides restaurants, a general market, bars, shops, and a full-service marina with rentals for boats, jet skis, and other watercraft. Central AC/Heat, Local Phone, TV with VCR/DVD, WIFI, Washer/Dryer, Gas & Charcoal BBQ, Rooftop Deck with Lakeview, Boat slip, Walking distance to Pines Village. An awesome view of the fireworks show! Exactly why we booked your rental in hopes for the kids to see the show and they did!